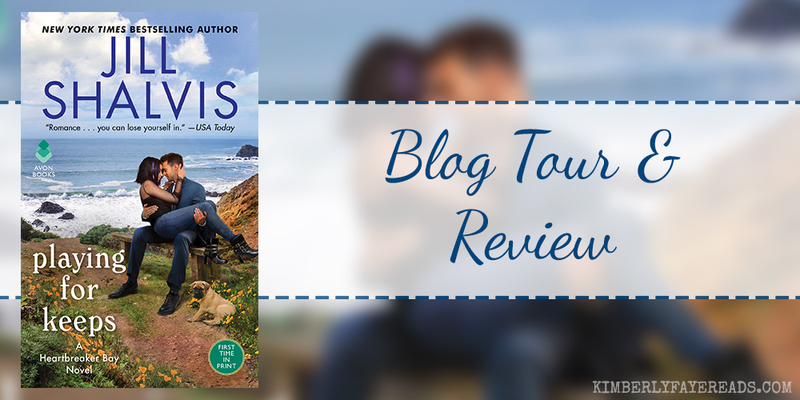 Welcome to my stop on the blog tour for Jill Shalvis’s latest, Playing for Keeps. If you’re a fan of the series, or just a fan of swoontastic adult romance, you should be reading this book. It was absolutely delightful. Oh, and I’ve got a giveaway for a paperback version over on my Instagram, so you should check that out. I know I can always count on Jill Shalvis to bring the swoons. Playing for Keeps is the latest in a long list of books of hers that I’ve fallen totally in love with. There’s just something about her writing that does it for me. Books like hers, particularly her Heartbreaker Bay series, are why I read romance. I love love loved Caleb and Sadie. She was sassy and relatable. He was total book boyfriend material. As much as I enjoy grumpy guys or bad boys, sometimes it’s nice to read a nice, uncomplicated hero. It’s also nice to read about adult characters who talk through the challenges they come up against in their relationship instead of ignoring them or just overreacting. Caleb and Sadie had amazing chemistry, especially considering she wasn’t his biggest fan early in the book. Oh and Lollipop, the three-legged dog they adopted together? All the flipping feels. I adored that dog… and I’m not even that much of a dog person. Side note: I love how Jill includes a pet in each of her books. I think it makes her characters more relatable. Plus, adorable pets always get a thumbs up from me. Playing the Keeps was so good that, instead of breezing right through it, I read it slowly to savor it. I didn’t even pick it up if there was a chance I would be distracted by something else. I loved Caleb and Sadie and their story so much, I wanted to give it my full attention. Things unfolded between them in such a natural way. I was all in for these two and I loved how they each grew throughout this book. Especially Sadie, though. She didn’t have the easiest past and I just really wanted to see her happy. Caleb gave her just that. They were amazing together. Yes, he was fun, flirty and charming, but she was highly suspicious of all those things. Is Playing for Keeps on your TBR?